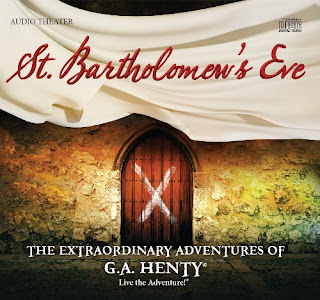 Maybe it was the thrilling audio drama our family reviewed called St Bartholomew’s Eve by Heirloom Audio, maybe it was some writings by the founding fathers I was reading, maybe it was the late night talks I’ve been having with my husband because we’re both drinking FAR too much coffee this fall season in Minnesota (it snowed a few days ago!!! )… it’s probably a combination of all of these that has me so intrigued and inspired at the tragedy of the loss of culture in America. We’ve lost the stories, the passion, the National Books that our country was founded on, and soon, if nothing changes, we will lose our freedom. Where are the Philip Fletcher’s of this century? You know, the young men that have such a passion for Christ and for the right to worship Him freely? The one’s that study military history on their own and at age 16 aspire to be something for their country, to do something for the Lord? I identified with the character of Fletcher in his “cut everyone down and let God sort them out” mentality. This young man was zealous, yet humble. God built him into a valiant Huguenot (or a protestant) willing to lose it all for the Gospel Truth, yet he never believed he was worthy of a reward or to be an example and gave all glory and honor to Jesus. We primarily enjoyed this on our LONG drive for our family vacation 🙂 Now we’ve listened to it a number of times. You see, St Bartholomew’s Eve takes place when the King of France was telling the people how they were to worship God. Catholicism was the religion of the land and if you didn’t do things according to the standards of the king, you would end up in jail or sometimes killed. The Protestants understood they were fighting for the freedom of their children and future generations, yet they felt the weight of taking a life. Each man’s life they took was someone’s husband, father and son. They didn’t take this lightly, yet they didn’t back down from the fight that needed to take place. The Huguenot were stripped of their rights at increasing rates. Things seemed to be looking up when Prince Henry, who was a Protestant, married Marguerite, who was a Catholic. This mixed marriage brought promising changes such as peace feasts between the opposing parties and even military advances in accord with each other. However, Marguerute’s cunning mother attempted to sow discord by spreading rumors that the Huguenot were preparing for a coup. She had the Kings soldiers convinced and they set out for a massacre. The doors of the Huguenot homes were marked with a large white “X” on the night the event was to take place. This was the inspiration for the beautiful album cover. As I was listening to the story and this intense scene danced around my senses, I looked down at the album cover and got goosebumps. It was as if it came to life and hit me like a ton of bricks! So many events took place in these two disks, I could never write about them all. 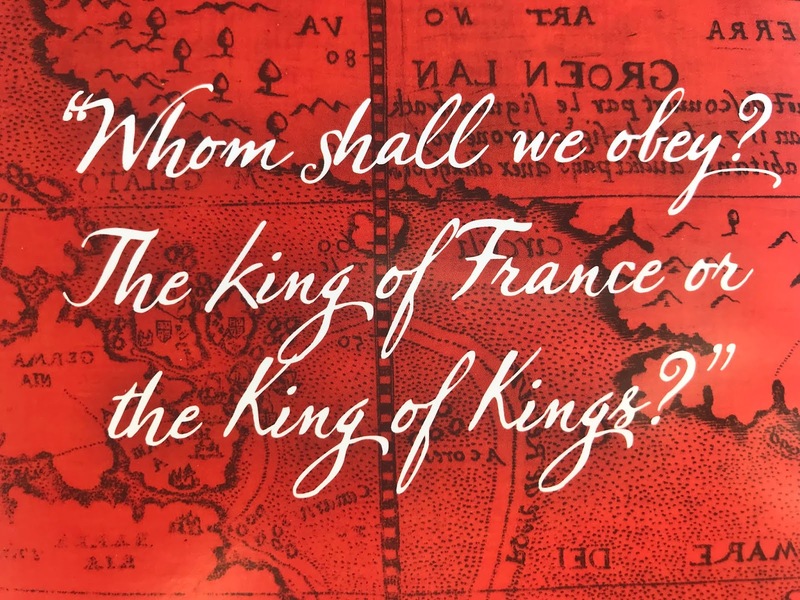 The movement of the Huguenot was an organic one where people simply responded to the need for freedom and the call to follow Christ. A moment we desperately need to happen in our country today. Fletcher and his comrades had a strong handle on Scripture and used it to determine their steps, lead them into battle and heal their broken wounds. These are the stories I want my boys to hear over and over and memorize the words to. I want to quote these sayings to my children. I want them to quote them to each other. I want them to dream of standing up to tyranny in the face of certain death. 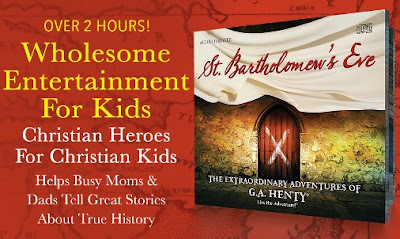 Oh, to inspire my children with the culture of Christianity, of America! When the young and old felt obliged and driven to contribute to the Gospel of Jesus Christ! Tear jerking moments (for me) included a funeral where hymns were sung, prayers uttered at the brink of war and in the moments of desperation, and the oaths taken between brothers in Christ standing side by side even when the odds are against them. I even replayed certain tracks over and over again so I could feel as if I were taking part in the scene at hand! What an adventure! This was BY FAR my FAVORITE audio drama to date. It strung a cord so close and dear to my own heart. Again, maybe it’s the coffee… but I don’t think so. I think St Bartholomew’s Eve is exactly the remedy to many if not all the problems facing America today. St Bartholomew’s Eve opens and closes with a man named Mr. George speaking to two young kids Sebastian and his friend skipping church. He proceeds to tell them the story of Fletcher and what exactly it cost for them to have the freedom to go to church. St Bartholomew’s Eve is one of those ways you can teach your children. I was 1 of 80 who reviewed this product.